OC introduces the 50-Series of attractive, slim monitors with clean styling and LED technology, priced to appeal to value-conscious consumers. LED backlights contain no toxic mercury (Hg) to contaminate the environment, and offer substantially lower power consumption than traditional monitors, further reduced with user-selectable power-saving display modes and switch-off timer. 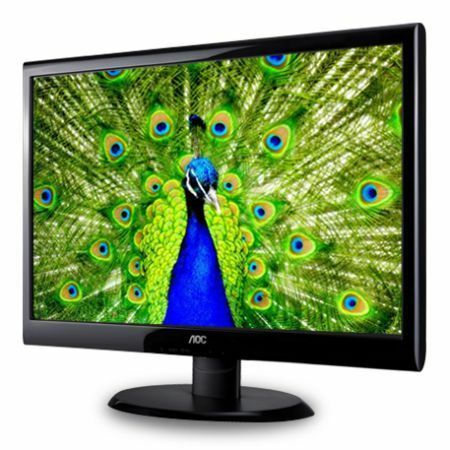 Although e950Swda presents simple monitors with a focus on value, AOC has not skimped on display dynamics, with a vivid contrast ratio of 20,000,000:1 DCR ensuring clear visibility and vibrant images. Outwardly, the 50-Series monitors do not look at all cheap, with a slim and rounded design that tapers to just 18mm at the top and sides. The back of the cabinet and top surface of the base feature a luxurious brushed texture. Control buttons are discreetly recessed underneath the shiny-edged screen bezel. Digital and power connectors are rear-facing for direct insertion, more convenient than more common downward-pointing ports.